Bitcoin Price Equivalence is a calculation of price, if the coin had the same supply as Bitcoin. ... but most of the real cryptos are either on par with the BPE or even below it! "A bitcoin conference has stopped taking bitcoin payments because they don't work well enough"
Bitcoin cash has outperformed most of the coins during this bullish market. Compared to other Bitcoin forks, BCH is unique and much better. It's amazing how biased and censored this forum has become. You are a hero member and the moderator gave you a negative trust because you criticized BTC. Same thing happened to me. 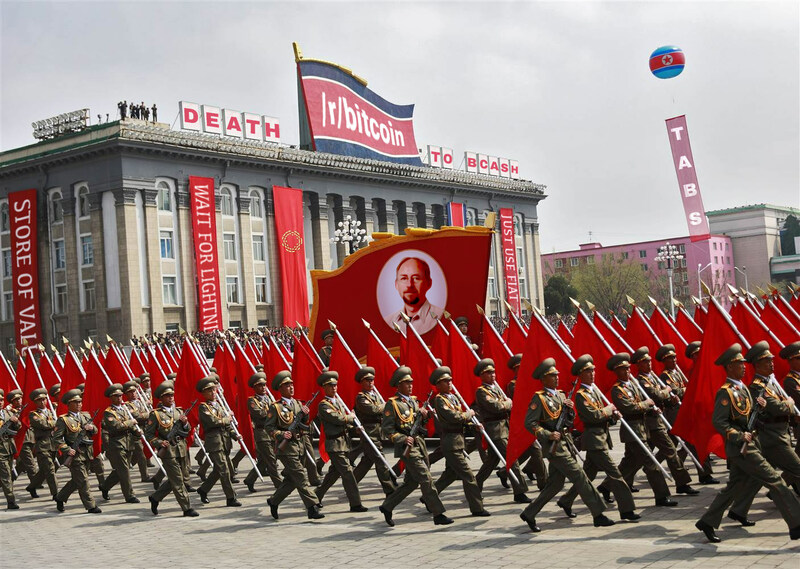 Michael Marquardt's (Theymos) photo should be on that North Korean flag. r/bitcoin is like the North Korean media, where any dissenting viewpoint is banned or censored. The conference organizer, Moe Levin, earlier told Bitcoin.com that his company was working to get bitcoin cash or other digital assets with cheaper fees integrated into the ticketing system. He told the news site: "We wish this was easier, but no ticketing options exist which can handle large volumes of ticket sales, and transaction fees on the Bitcoin blockchain exceed $30 at certain times of the day." So, these new q-addresses, I can use them instead of the 1-addresses, right? Even from exchanges? —ACINQ, Blockstream, and Lightning Labs announced that a release candidate for the Lightning Network 1.0 was READY along with a successful cross-implementation test on Bitcoin mainnet. Could you please share your thoughts on what impact this could have on the Bitcoin network in the long run? Lightning Network will help Bitcoin and Litecoin scale. I'm very excited about this and looking forward to it being used by everyone very soon. Cross-chain atomic swaps will also make it very easy for people to interchangeably use Bitcoin and Litecoin. Bitcoin cash continues to amaze me. It's in the green amid a sea of red today. I have to admit I didn't want to follow this project at first, but the bitcoin community has shown that it has no interest in making bitcoin better. Maybe bitcoin cash has an opportunity to step in and be useful the way bitcoin was for too short a time. Cool - Get it done - make it ready - test it out! Really - make it good and figure out where its real use cases are and try to compete with simpler tech (BCH). BCH community is open to all theses good things and will not kill the good things - rather adopt it if working. But for now and the near future max on-chain capacity together with enough decentralization & known security and less attack surfaces is the way to go. Even with centralized payment channels and more regulation LN doesnt necessarily need to fail. People will use the most established and convenient system. Blockstream refuted bigger blocks because they didn't want centralization. Not only will LN be extremely centralized, it will be regulated by the government. Say goodbye to censorship-resistance, permission-less and trust-less. Without these, Visa is more "established and convenient" than LN. The Bcash trolls know it and do whatever they can to manipulate the market. But after all we can all see Bitcoin is king. When LN is operational we can expect Bcash to drop below 1K. You have been warned folks. I have joined other forums. I own BTC just like I own other things. Banning me from criticizing BTC is like banning me from criticizing my politician. Moderators are creating echo chambers, which means problems, with the things I own, do not get fixed. r/bitcoin is like the North Korean media, which also likes to ban and censor dissenting viewpoints.